The DutchX allows to exhange any ERC20 compatible tokens. Ether is not an ERC20 token, this is why we need to wrap it first. This step is mandatory for WETH and for any other ERC20 token. The DutchX deposit operation will allow you to add tokens to your balance. Wrap 0.1 WETH: Remember Ether is not ERC20 compatible, so we need to do this step (deposit function on WETH contract). Set allowance, so DutchX proxy can transfer 0.1 WETH: Otherwise the deposit will fail, because the DutchX wouln’t be entitled to do the operation. 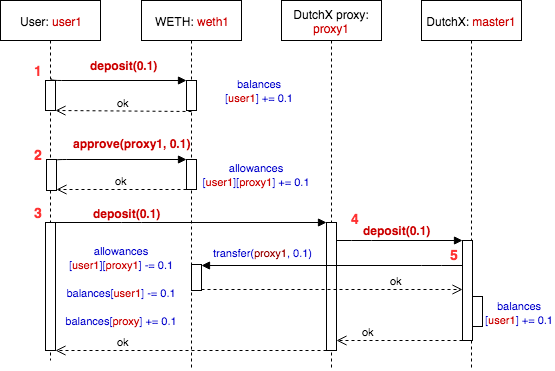 Deposit 0.1 ETH in DutchX proxy: If we did the two prior steps, the user will have 0.1 WETH more in it’s balance. In this guided example you will make a dApp that wraps ether, sets the allowance and deposit into the dutchx.